As expected, Love Live will sell from 20k+ in the first week, that's good tho. I'm just dying to know the next week list since YOI will be available in the list. GOD BLESS I CSMT WAIT. Hibike and Kizu are selling pretty good but they're not big hits, well they're both sequels so I suppose this is in line with expectations. Glad Tsukiuta and Binan are still selling pretty well. Natsume too. Touken Ranbu: Hanamaru almost 10K DVD !! Who is buying this sh*t ?! YES! My sword princes will reach at least 23k in vol.1 ! Not bad for Izetta. New Game sold well huh? Vivid Strike and Euphonium sold better than I feared. And Natsume dropped in sales, but it was expected as too much time passed from S4. Cover art for Sunshine Vol.4 in case anyone wants to see. Nice to see New Game! and Hibike doing well. 2.5k for Izetta isn't half bad. Izetta's sales are not disastrous at least. Wasn't there supposed to be quite a few Fall 2016 Vol 1 sales this week? The rankings though... They don't look positive. Ouch, Magic-Kyun sold so little, and that's with event ticket application. That doesn't bode well. Will be interesting to see how much Yuri on Ice sells next week. My prediction: it will genuinely be a shock if it sells less than 30k. Not surprise about Kizu but Strike the blood II? Do Japaneses love "No sempai, it's our fight" that much? Yeeep Mahoiku didn't rank in the novel ranking for its 10th volume earlier this month, and doesn't rank in the BD/ dvd ranking for its first bd/dvd volume either. Although a cutoff at 2.2k is super high so that's kind of hard to know how much it failed. Hmm good thing that Bungou Stray Dogs is selling well (I finished it last night at least for S2 si it deserved that amount at least), as for Touken I'm glad its still selling decently though. Izetta, not so bad I guess for 2k sales. 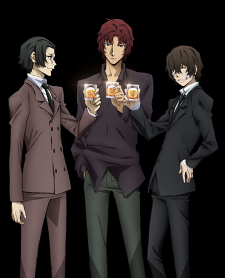 That mafia trio in the BSD cover. Vol 7 released on 23 December . It did quite decent I guess considering people liked Dark Era. Only numbers I cared about and all within my expectations (Maybe with an exception to Natsume Go). Looking forward to start watching New Game because I think I will like it based on the reviews I have read. 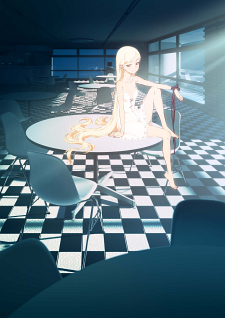 This reminds me to watch Kizumonogatari II movie soon. Strike the Blood II still killing it there. Izetta is fine for now, but it's probably gonna dip pretty low. Nice to see that Re:Zero is still consistent. Most likely more than that. Hell even the soundtrack is close to be the best selling one ever since data was collected in 2009/10 so probably even best selling one of the decade. So Tales of Zestiria wasn't even ranked in 1st week (BD box was released on 22). Japan really hate Rose. Considering Rose had very little screen time in season 1, i doubt that's the reason. Kinda expected this to happen. There's no way Love Live will beat Kizu lol. Some more 2016 Yearly Data is out. I'll not bother posting data that will be eventually posted by tsubasalover. But here is data that she doesn't post. Note: This includes sales from Anime BD/DVD, Music BD/DVD/CD, Light Novels/Books, and Manga. This doesn't include other parts of a franchise such as mobile game sales, Box Office revenue, merchandise sales, etc. Series most affected by this are the large franchises, such as Kimi no Na wa., ONE PIECE, Gundam, Love Live!, etc. Note2: Love Live! includes Sunshine's sales, while Idolmaster includes Cinderella Girls, Million Live, other spin-offs, and Side-M. The News Club: Quality News/Discussion (anime, CDs, manga, novels, games, seiyuu), & sales data (daily, weekly, mid-year, yearly). Is it because the OPM series update slowly that there's not enough manga published in one year to rival Seven Deadly Sins and Boku no hero academia? @Ejc no.3 and 21 are? Sorry, you know that I can't understand JP. Edit:- Do you have an English version of that list? Osomatsu-san made 6.3 billion yen and only behind Love Live and One Piece? Amazing. Still can't believe they haven't even made a season 2 announcement. Nanatsu no Taizai and Boku no hero academia released more manga volumes than OPM this year. #21 (Sekaiichi Muzukashii Koi) is a TV Drama. 17　2,703,360,132　Kimi no Na wa. Monogatari and Re: Zero doing work. Just what I wanted to see. Top 300 BD/DVD Rankings from the Oricon website for this week, including Oricon Biz leaks (highlighted in red) of sales, and also from other sales list from Oricon Youtaiju. I don't know when the full Top 100 BD/DVD lists will be out, because it is usually delayed during the Christmas holidays weeks.